Scott Reid, Curator, Cyfarthfa Castle Museum and Art Gallery died suddenly on Saturday, April 26, 2014 at the tragically young age of 40. Scott graduated with a degree in museum studies from the University of St Andrews in the 1990s. I first met him when he worked for my husband as a research volunteer at the National Museums of Scotland in the Science and Technology department. He was both perturbed and amused by an erroneous security check which falsely identified him as having committed GBH. A less likely candidate for such a crime was difficult to imagine. Scott was calm and gentle individual who applied a quiet intelligence to everything he did. Following a short spell at the Scottish Mining Museum, Scott moved to Cyfarthfa Castle in Merthyr Tydfil to take up post as the museum’s tenth curator, in 2000. During Scott’s fourteen years in charge of the museum, free entry was introduced and visit figures increased by 30% to over 90,000 by 2013. Scott developed a professional team at the museum including an assistant curator and collections manager, education and community engagement staff. He also worked alongside Merthyr’s many heritage groups, gaining respect and friendship from a wide range of museum supporters. 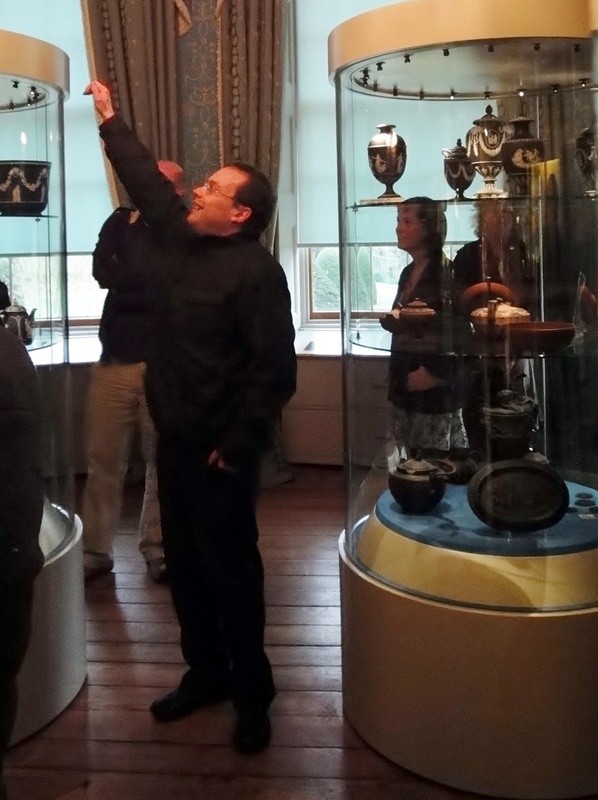 He led several gallery and store refurbishments, proudly showing off the latest LED case lighting to a gathering of curators in 2011 (see photo). Scott was also responsible for several important exhibitions including a partnership with the Tate to display some of Turner’s works alongside those of Penry Williams, the Turner of Wales, which generated 15,000 visits in 2010. As a committee member of the Federation of Museums and Galleries of Wales, Scott also gave generously of his time and expertise to the wider museum profession. He ran its training programme and represented the Fed on the Creative & Cultural Skills Wales Advisory Committee. In this role he contributed to developing Creative Apprenticeships in Wales, the review of the National Occupational Standards for the sector and the introduction of the new cultural heritage vocational qualifications framework. At the end of 2012, Scott was looking forward to leading a major redevelopment programme at Cyfarthfa when he was called into hospital for surgery which should have seen him back at work within a few weeks. Sadly, things did not go to plan and he spent most of 2013 in Cardiff and Vale University Hospital Neurosurgery Department. However, with the unfailing support of his colleagues at Cyfarthfa he was able to return to work by the end of the year. We were all delighted to see him again at the Federation’s conference in March. He looked so well and was looking forward to leading his museum’s redevelopment. It was a great shock to everyone therefore when he was discovered dead at home on 26th April. Our deepest sympathies go to his parents and family in Scotland, and to his colleagues at Cyfarthfa. Museums in Wales have lost a truly professional curator, a kind and generous colleague, and a cheerful friend. We will miss him.